Desks are mostly the first listed item when we are taught about living things and non-living things in childhood at school as they are the ones that are present immediately in front of us. Not only at schools but at various stages of our lives, this non-living thing is always at our front making us indirectly dependent on them. Any creator needs a desk to give his imagination a physical form through illustrations so that his thoughts can be conveyed to others. 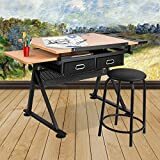 People, who work in artistic fields or those with a passion for arts, will need an art desk that can comfortably accommodate themselves and the gadgets they need for their creation. 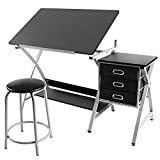 If you are one among them and right now looking for a good art desk, you are at the right place as we are going to list you the top 10 art desks of 2019. The studio designs comet center contains a desk with three storage shelves and the desk layer can be adjusted from flat to 20 degrees. The table top has 24-inch pencil ledge that can hold pencils or markers. It also consists of a 20.5” tall stool made up of steel and six floor-levelers. The desk can be opted by those who are looking for a simple study or writing desk with a flexible table top. This product made by ZENY looks so appealing and will definitely catch the attention of painters. The 0-45 degrees adjustable table top comes with holders for pencil, brushes, and colors along with a padded stool. The desk legs stand on a rubber foot that provides stability and avoids scratches on the floor. The pro craft station has its tabletop mounted on the steel basement that comes with wheels to enable mobilization. The table top is 0-45 degree adjustable and contains removable side trays. The table top is made up of maple and sports a smooth even finish. The side trays can be used to host pencils, markers and other essential things one needs for their work. The only minus of this product is that it does not include a stool. 2 sets of height adjustable 3-drawers. 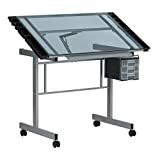 The Yaheetech drafting table has an adjustable tabletop from 0-60 degrees with a pencil ledge. The table comes with three storage drawers and a bottom shelf that can host water bottles or paper bundles. The curved x-shaped table legs with rubber feet provide stability and the steel frame is said to be corrosion free. This table suits greatly for drafting and sketching purposes. A Stool with a faux leather seat. Bottom shelf and three drawers. 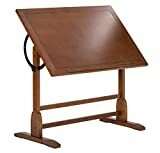 The 42-inch vintage drafting table is made up of rustic oak and gives a vintage look that will please your eyes. 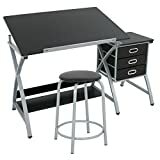 The table top is 0-90 degrees adjustable and also contains a 24-inch pencil ledge emulating other studio design desk. Though the product does not have additional storage drawers and a stool, people can still opt to buy it given for the durable wooden frame and vintage look. The vision craft station contains a tempered blue safety glass top mounted on a steel construction. The legs are provided with wheels so that the table can be easily mobilized. The top is adjustable from flat to 70 degrees and contains four removable side trays. It also has a unique 23.75” wide tray for holding pencils. Ample work space suitable for painters. This simple and sleek table comes with 0-45 degrees adjustable table top made up of wood with a pencil ledge. There is also an additional slide out plank below the table top that can be used for keeping materials. There are 2 storage drawers and a side tray attached to the tabletop. The product is rust resistant. 2 storage drawers with enough space. 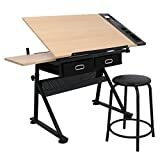 The super deal drafting and drawing desks are one of the best art desks around as it is quite sleek and well designed. The 0-50 degree adjustable tabletop contains a side compartment to hold pencils, paints, and brushes. There is also an additional table below the table top and the desk contains two drawers. This desk will be a perfect fit for your home as well as your office. The desk is made out of the MDF, PVC and steel combination where the table is made out of MDF and the holding legs are made out of steel for stability. The work surface is adjustable from 0-48 degrees and there are three storage drawers along with an additional storage shelf at the bottom of the workspace. Solid construction that gives stability especially for painters. The forerunner of our list is the Tangkula art desk that sports an artistic design and sleek look. The adjustable table top is made up of wood and it comes with a pencil ledge. There are three drawers and also an additional storage space below the workspace. The curved steel holders supported by durable steel legs provide the much-needed stability for painters and writers.